Roslindale is certainly a happening place these days. Over the past decade or so, this neighborhood of Boston has had its downtown spruced up to the point that it now has one of the most attractive centers in the entire city. And one outcome of these changes is an influx of top restaurants that have turned it into a bit of a destination spot. From the outstanding Village Sushi to the quirky Birch Street Bistro to the highly-rated Italian restaurant Delfino, this neighborhood has certainly become a true hot spot for lovers of fine food. 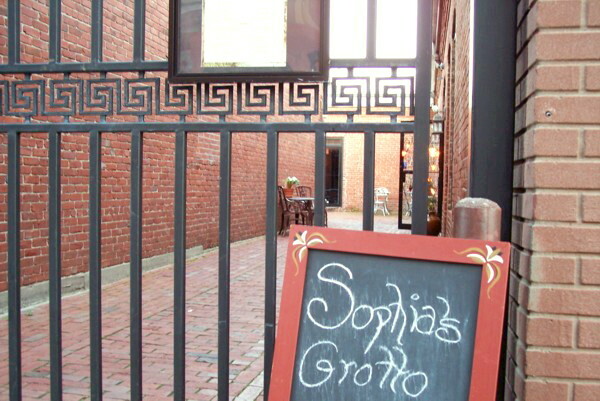 Add to the list one more Roslindale restaurant that should be on your short list of places to dine: Sophia's Grotto is the fun, intimate, cozy type of trattoria that is an equally good choice for a first date, a night out with friends, or an evening with the kids. This Mediterranean restaurant, which tends to place a slight emphasis on Northern Italian cuisine, shares a courtyard with several other restaurants, including the aforementioned Birch Street Bistro and Village Sushi. Indeed, the only way in to Sophia's Grotto is through the courtyard, so it is quite easy to overlook. The interior of the restaurant is all exposed brick, with a cute little bar to the left and a dark nook for quiet conversation to the right along with views of the courtyard throughout, which is a great spot on a warm summer night (and is mostly protected from the wind by the surrounding buildings). While the atmosphere alone is enough for one to fall in love with Sophia's Grotto, the food here gives you yet another reason to consider this a special restaurant. The Boston lettuce salad, for instance, has a tremendously complex mix of sweet, savory, salty, and zesty tastes coming from the golden raisins, walnuts, blue cheese, and apple cider vinaigrette; the antipasto includes some of the best grilled chorizo you'll try in the area; the paella is hearty and delicious, with a richly savory red sauce that gets soaked up by the rice; the ziti boscaiola has fresh prosciutto, just the right combination of garlic and mushrooms, and a number of tasty spices; the pork tenderloin has a rich flavor, with the meat being tender and juicy; and the wood-fired pizzas have a slight char on the bottom of the crust from the high heat, and some of the topping combinations are simply wonderful (the Torino pizza, for instance, has an earthy mix of oyster, shitake, and portabella mushrooms along with truffle oil and fontina and mozzarella cheese). Specials include wild mushroom ravioli that has asparagus pieces and a delightful truffle smell coming from the creamy sauce. Sophia's Grotto also features a number of small plates, including bruschetta, artichoke hearts, mixed olives, meatballs made with pork, veal, and beef, and poblano peppers stuffed with ricotta cheese. The restaurant has a decent wine list for those of you who like a bottle of red or white with your meal, and some outstanding beers, including Chimay and Duvel. Desserts include tiramisu, cannoli, and chocolate mousse. Roslindale Village has certainly come a long way over the years, and suffice it to say, it has some real destination spots for restaurants, including Sophia's Grotto. Make sure you give this restaurant a try before the rest of the world finds it. Copyright © 2005-2013, Boston's Hidden Restaurants (www.hiddenboston.com).